July and August brings us the hot and humid days of summer and in some of the parks around Nichols Hills it also brings the annual return of the Mississippi Kite. With the arrival of July, it’s time once again for us to remind park visitors that Mississippi Kites may be nesting in some of the trees in and around Nichols Hills and that park goers should be aware of potential encounters with nesting Kites. For the safe use of our parks during the Mississippi Kites’ annual visit, please educate yourself on the Kites by reading the information provided below. With knowledge and understanding we can all learn how to share our wonderful parks together. -- Many types of wild birds don't go to too much trouble to protect their young. If danger approaches, many of these parent birds just back away and don't do much about it. -- In contrast, Mississippi Kites are very good parents. They do not sit idly by if they feel that their young are in danger. If the adult kites feel that the need is warranted, they may even fly towards the object that they think is a threat to their babies. The purpose of these "dive-bombing" flights is, of course, to scare away the person (etc.) that they feel is getting much too close to their nest. -- Some adult Mississippi Kites do these "dive-bombing" flights towards people......and some do not. The important thing to realize is that not all Mississippi Kites are a source of negative interactions with people. In fact, some adult Mississippi Kites build their nests so high in the trees that they do not consider nearby people to be a danger to their babies. Also, some adult Mississippi Kites choose to build their nests in very close proximity to popular public playgrounds and there is no trouble whatsoever between the Kites and people. -- Fortunately, the problem is short-lived. It only lasts for a week or two. When the babies fly away from the nest, the problem ends. -- It is usually in late-June or early-July when reports come in about negative interactions between Mississippi Kites and people. 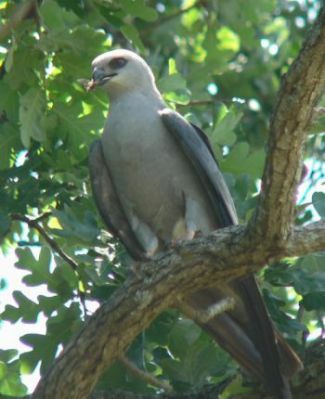 -- If you find yourself in a situation where an adult Mississippi Kite is making "dive-bombing" flights toward you, it might be possible for you to resolve that problem by simply moving away from the vicinity of the nest tree. Also, if you wave your arms above your head as the bird approaches, it will usually cause the bird to veer off and not approach you too closely. -- It is also important to realize that Mississippi Kites are not "bad" birds. They feed on lots of "locusts" (cicadas); they help control the population levels of this insect pest. Mississippi Kites are beautiful birds and are a lot of fun to watch. It is very beneficial to have them sharing our urban environment. -- A wise person once said that we "fear most what we know the least." That is very true. If you arm yourself with knowledge about Mississippi Kites and their behavior, it will better enable you to enjoy your time out-of-doors.